I love Robin Roberts. I’ve been watching her on Good Morning America for as long as I can remember. I’m an ABC girl and I’m not ashamed to say so. When I was in school and thought about becoming a journalist, I started to really pay attention to the female journalists that I loved. 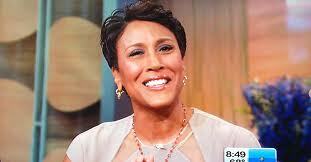 Robin Roberts was one of my top three. I began to, and still do, admire her because she is real; always at ease. I wanted to be able to tell the story of another person with such finesse. I wanted to be good at what I did despite whatever was going on in my personal life. I still aspire to have the ease and love of the job that Robin shows us each day. I start my day with Robin and the GMA team. I followed along with everyone else when she announced, underwent treatment for and beat breast cancer. I cheered to myself the day that she came back to the GMA set because I missed having her in my life each morning. Robin is part of my routine. As I watched the video of her announcement this morning, I thought back to when I was in college and when I decided I wanted to encompass the traits of my favorite journalists. But today, it’s not only the job-related traits that I admire in Robin. I admire her strength, courage, fight and openness to share with the world her struggles and her hope. All women can take lessons from Robin Roberts. Find happiness in who you are; strength when times are tough; peace in knowing you are not alone; and always remember to smile. Robin, I wish you the best as you fight this new challenge in your life. I just know you can beat it!